We got back this specific spreadsheet (linked here for interested readers) containing all data available up to December 5th. That data is the foundation upon which we based our December 23rd article. First, we reasonably expect that the Northwest Indian Fisheries Commission (NWIFC) possesses the data. State governing rules require that Tribal Fish Receiving Tickets make their way to the NWIFC within six working days. These fisheries wrapped up in October, so we reasonably believe the tickets should be on hand at this point. Second, the NWIFC, in a post made this October titled “Data Drives Fisheries Management” was clear that tribal catch data was shared in near-real-time with the state. Specifically we quote “Treaty tribal fishermen are required to sell their catch to licensed buyers who must report catches to the tribes within 24 hours. That information is often shared with the state co-managers on the same day it is collected.” At Tidal Exchange we believe in scientific, data driven fisheries management as well, which is precisely why we requested the data, and reasonably expected it (especially given the foregoing quote) to be present. Finally, in discussion with the state, when we questioned the pipeline for data movement between the NWIFC internal “Tribal Online Catch Accounting Systems” and the state databases, we were informed “the two systems synchronize electronically at regular intervals to ensure that each database has the same information as the other” We wanted to be certain that there was not some impediment to Coho reporting — but if the databases synchronize regularly, we can’t see how that happened. Given all the above, we stand by our reasonable expectations that Tribal Coho reports from 2016 should be available at this point. While we’ve shown above that it is reasonable to expect Tribal catch records to be available by now, some have pointed out that Sportsfishing Catch Record Cards are not even collected until April 2017. After submission the cards are compiled and a report shared with the co-managers but this would be well after season setting/North of Falcon. Is this a “gotcha!” moment? Nope, it’s how this part of the process is designed — and is why there’s more to the story..
It’s precisely because of late deadline for Catch Record Cards that the state conducts intensive in-season monitoring of recreational fisheries. This includes both creel counting at boat ramps/marinas as well as on-the-water test boat fisheries. These two data streams are developed into statistically accurate models of recreational fish catch, and are used for in-season management — with catch figures shown publicly. In particular, during marked/selective Chinook fisheries with specific catch/encounter thresholds we see intense monitoring and clear examples of analysis, transparency and action. Specific examples of this can be found in 2016 area closure announcements made by the state here and here — as well as coverage of the dates and harvest numbers in the mainstream media (example from Seattle Times here). All of this is near-real time and transparent. There are some recreational fisheries, for example typical Coho seasons (2016 very atypical) where co-management decisions to continue/suspend recreational fishing depend on a blend of data from creel counts, test boat results as well as terminal area tribal fisheries data. This further underscores the need for timely tribal catch reporting to ensure appropriate management responses are made. This all said, we are investigating claims that the state’s delivery of the compiled data to Tribal co-managers has not been made according to schedule, and will do a story on that when we have additional facts to report. Our mission is to advocate for sound, transparent, scientific, data driven fisheries management, and to hold State and Tribal managers to their commitments and public statements. In the last month we’ve called out ODFW and WDFW over walk-backs on their Columbia River gillnet promises, state legislators over their lack of support for recreationals, and now Tribes for not sharing catch data like they said they would. This is the second in a series of articles featuring post-game analysis of the 2016 Coho and Chinook season. If you like and support this sort of reporting, and you use Facebook, give us a Like or Share below! 9 Comments on "Tribal Catch Reporting, Part 2"
Page on Facebook. I am Austin Hoesley the creator and lead moderator on the page. I work directly with WDFW enforcement officers and any public members who ask to join and by evidence participate in some way in Washington’s fisheries. Your approach to data gathering and presentation is exactly what needs to be shared with the public in as many media steams possible. Please consider sharing your publications directly to the page and I as well as the other moderators will approve your content. Let’s Keep this type of accountablety going in the right direction. I would be frustrated, too, if I couldn’t obtain summer and fall harvest numbers in early December. What you have here definitely shows that there is long delay in WDFW’s making tribal net catch data available to the non-Indian public, at least for this year for the specific request you made. The latest catch you were given was for June 26, I think. For whatever reason, catches after that date have not been entered into this system yet. I would expect that there is more Chinook as well as coho catch that was on fish tickets but has not made it to this database yet. Certainly no coho were harvested up to June 26, which, of course, is why you see no coho on this report. I think at least some of you know this well and have chosen not to fully explain the data you were given to your readers. You have certainly not demonstrated anything about whether or not tribal fishery managers have created and shared catch reports as required, yet your headlines imply some great transgression on the tribal managers’ part. As one experienced in Puget Sound salmon management, this looks to me more like a delay in getting fish tickets entered in the database. Certainly that would be the thing to assume instead of making wild accusations before looking into this a bit further. I am also curious as to why you did not request non-Indian commercial catch reports as well. I thought every dead fish was a dead fish. Whatever your intent, this whole thing has the appearance of trying to create a controversy to get people riled up and interested in your site (it worked on me — got me interested). I do not think that’s the right way to focus people on rational discussion of the important issues with an eye towards having a less controversial and divisive preseason process in 2017 as compared with 2016. The issue of different standards for recreational and net catch reporting is a different topic that should be treated separately. It would be a shame if the state were delinquent in turning over recreational catch estimates to the tribes as agreed, but that is not the same issue as the unequal reporting requirements, currently fixed in law. There are problems with a number of the datasets due to the delay in recreational catch reporting, estimation instead of total counting of catch, and high uncertainty in assessment of non-catch mortality in an era of increasing non-retention fisheries. Many improvements could be made in both net and sport catch reporting using 21st century technology, but that won’t happen if people who should know better continue to focus on picking fights instead of trying to find the common ground where solutions can be crafted. Finally, speaking of transparency, your statement “we don’t play favorites” is easier to see through than the ‘tater stew in Woody Gutherie’s “Talking Dust Bowl Blues.” Sure you’ll go after anyone, as long as they fish with a net. This is not an attitude that will contribute to objective, unbiased, resource management, in my humble opinion. Kit, The NWIFC, in the article we linked, took the state to task for a five day long unreported segment of 2016. In that same piece, the NWIFC stated that their own data is “often shared with the state co-managers on the same day it is collected” — which isn’t at all possible sending green-copies in stamped envelopes, it’s database synchronization. And if you wish to take us to task for stirring controversy, I’d ask if you’ve done the same to the NWIFC for claiming they do same-day-sharing of information, when nothing for the entire coho season is currently in the synchronized databases. Like you, we look forward to 21st century improvements on all monitoring fronts. Well, I was going to just say “Happy New Year” here, and I’ll lead off with that, sincerely. But I do have to say that WDFW not requiring catch reporting for a period of time in April was an amazing slap in the face, or “eye poke” as we used to call it at the Pacific Salmon Commission meetings. I guess I could ask why you did not take them (WDFW) to task for that. As far as I know, the tribes require reporting of all catch and that has been happening. I simply do not think that whatever led to your not being able to receive the information you requested was not due to non-reporting of catch. I am not directly involved, so I do not know for sure, but I would bet that I am right. I stand by my statements that I believe that the approach you are taking here is not constructive. I am disappointed because I know some of the people involved, and I know that you could do much better. 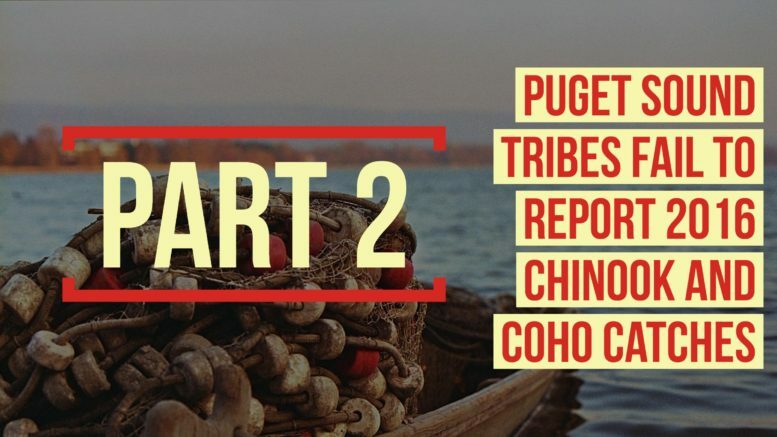 I believe this report is targeting Puget Sound Tribes, and if so I believe there was no salmon fishing occurring for non-tribal entities during this time due to numerous marine areas being shut down for reaching catch quotas, just pointing out an occurrence. I don’t think production of harvest numbers in January and December are necessary. Considering these numbers are used to project forecasts, which is far from an exact science, for returning adults 3 and 4 years down the road. But I do agree that all parties should be held accountable if we are to see improvements in salmon stocks in the Puget Sound. I have filed multiple FOIR (Freedom of info requests) related to area 6, 7, and 9 early Blackmouth closures. I was asked to withdraw my original request in place of a phone conference and was told they would supply me with information to review before the meeting. I received a massive amount of information which I promptly started reading. I believe the state was trying to overwhelm me. Two weeks later I received a call to see if I was prepared for the meeting and they we’re very surprised when I indicated I had read all the info and asked for more so that I could reconcile the posted creel reports. Long story short and more importantly one of the major things I learned was back in 2007 when the original (state mandated) study was done the biologists told the state they would need to reconcile the formula every year with catch record cards due to the decline of Chinook Salmon. I have yet to find any information regarding the reconciliation and have asked WDFW repeatedly if this has ever occurred. I have been stone walled at every turn. The state and tribal co-managers did change the formula to a algorithm around 2012 (same time our NOAA extended fishing permit expired). Whats interesting is this was the first year our catch numbers exploded and they shut down area 9 Blackmouth early. I believe and no one at WDFW has shown me otherwise that our catch formula calculations are based on 2006/07 data used to created the original formula. There is no doubt in my mind we are getting screwed at every turn by the state and tribal co-managers and that is why we are giving our hard earned money to Canada in the form of licenses, fuel, lodging, and food. I can also tell you there is nothing more gratifying than catching a 20-30# unclipped Chinook (tribal conservation fish) just miles from US waters and slapping it on the deck! As a followup — the US postseason report for Pacific Salmon Commission was completed December 29, 2016, and sent to Canada via the Pacific Salmon Commission. You might ask your US reps on PSC bodies for this report. It includes tribal and non-tribal Chinook and Coho net catch numbers. It also includes inseason estimates of recreational catch from specific areas and times that were surveyed. The numbers in this report are consolidated and not broken out as you requested from WDFW on Dec 5th. However, it is stated, and I believe from conversations with a number of people, that these numbers (i.e. the net fishery numbers) were compiled from fish tickets that were created, submitted and shared among fishery resource managers according to normal procedures. Therefore, the numbers were available earlier and could be broken out by catch area and so forth. In other words, the tribal managers (and the state manager, WDFW, at least as regards net fisheries) did NOT “fail to report 2016 coho catches” as you stated. Your headline is, simply false. You did not receive information that you could reasonably have expected to receive in response to your December 5th request, and that is a problem, but we do not know why you did not receive that information. I do think, though, that we have very strong evidence that any failure of any manager to report catch was not a reason for your not receiving this information. The damage has already been done as far as your false headline being copied and spread online. I don’t think any apology would help here. I do think you need to do better in the future.